There are many pros to a plate full of plants. From nuts to lentils to wholegrains, plant-based foods are antioxidant-rich and high-fibre wonders. But what’s often overlooked is their ability to pack a protein punch, especially when swapping out meat and dairy from your diet. Here are the 5 best plant-based sources, and how you can easily add them to your diet. Soy bean is a vegetarian’s delight. Just one cup of cooked soy beans (aka edamame) has a massive 18g of protein. So next time you’re at sushi train, hit up this protein-packed appetizer. Tofu. Another soy-based option made from curdled soy milk, contains up to 8-12g of protein per 100g serving. It’s also your perfect blank canvas to marinate, fry, scramble, bake, you name it really. Nuts. Just like eating fruit and vegetables, eating nuts is a daily ‘must do’. Not only do they dish up hunger-busting protein and fibre, they’re filled with waist-friendly fats. Research shows that eating a handful (30g) of nuts daily can reduce the desire to overeat later in the day, helping to reduce your overall daily kilojoule intake. Looking for intake inspo? Add them to stir-frys, smoothies, salads or just chomp them raw for an afternoon snack. Wholegrains. Grain foods like wheat, rye, barley and oats are naturally rich in plant-based protein, on top of other nutrients like vitamins, minerals, dietary fibre and phytochemicals. Recent findings from the Grains & Legumes Nutrition Council’s (GLNC) annual food category audit, revealed that close to one in every five loaves of wholemeal/whole grain bread assessed was considered a ‘good source’ of protein, boasting at least 10g per serve – the same amount found in a glass of milk or two boiled eggs. 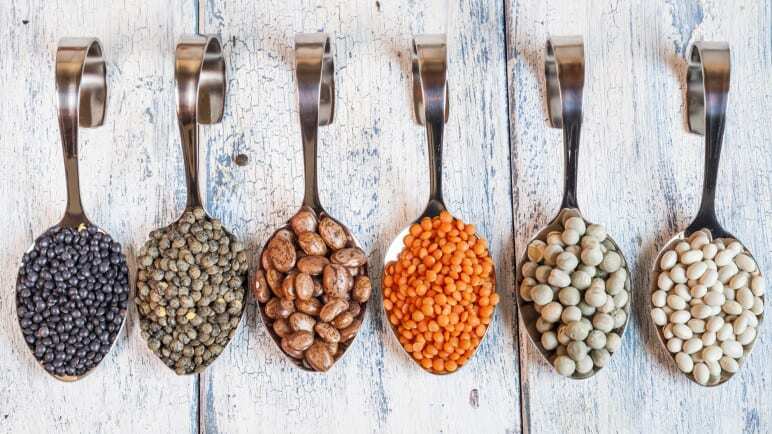 Legumes like chickpeas and lentils have a unique package of protein, fibre and slow-digesting carbs – the ideal combination for weight control. With around 9g of protein per half a cup, they’re a cheap and nutritious addition to salads or curries or veggie patties. Baked beans are another legume that are a solid protein source (around 9g per 100g). They’re also a source of energy-boosting iron and their slow-releasing carbohydrates help stabilise blood sugar, helping to keep sugar cravings at bay.